The female version of Mass Effect hero Commander Shepard finally made it onto the cover of a Mass Effect game this year—as long as you reversed the piece of cardboard in Mass Effect 3's box. She even finally starred in a Mass Effect trailer, a scant five years after hordes of players started playing as her in the first Mass Effect. But the male Shepard is back to hogging the glory. Some of us don't even recognize that guy. 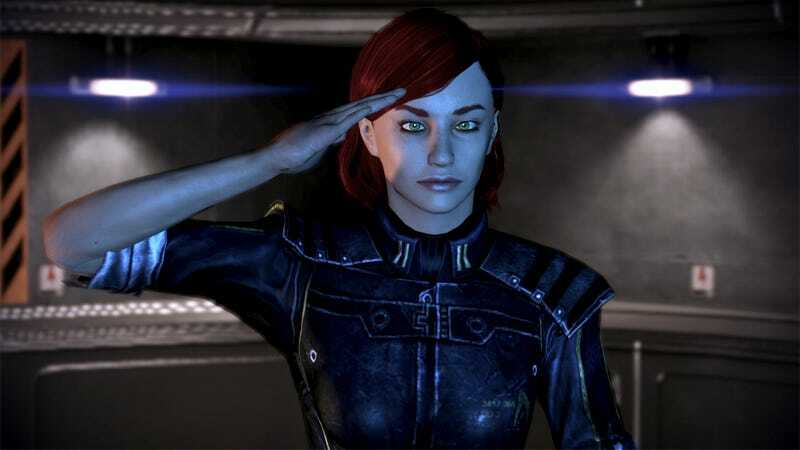 The three Mass Effect games allow players to choose Shepard's gender and ethnicity. They let players fall in love/lust with male characters, female characters and/or aliens. They let you choose who wins and who dies. The games, up through the controversial end, appear to be about choice. That's the reality of the series. The reality of the game's packaging? Of this ultimate collection's public face? It's a game about a dude. In light of that tweet, it seems that there could be something FemSheppy for this new edition. We've dialed back our headline accordingly. It originally read: "There Will Be No FemShep Cover of the Mass Effect Trilogy". The game's PR rep had told us there would be no FemShep edition of the game, which I took to indicate there would be no FemShep cover. If I was too hasty, I apologize. We'll see. As a reader below points out, to truly capture the malleability of Shepard in the series and not alienate any fans, the box of Trilogy might best not feature any visible Shepard at all.